In addition to working on making a proper one-spoon quenelle (or rocher), I really need to work on applying a proper sauce “drag”. The elongated teardrop shape on a plate looks simple, but it is tricky. More practice is needed to apply that properly. On to this dish. I really liked the short rib preparation from course #2, but I absolutely loved this one. It is one of the best steaks I have ever cooked. I am sure that is partially due to the dry aged rib eye steaks I bought from Pete’s Fine Meats, but also the preparation was spot on delicious. 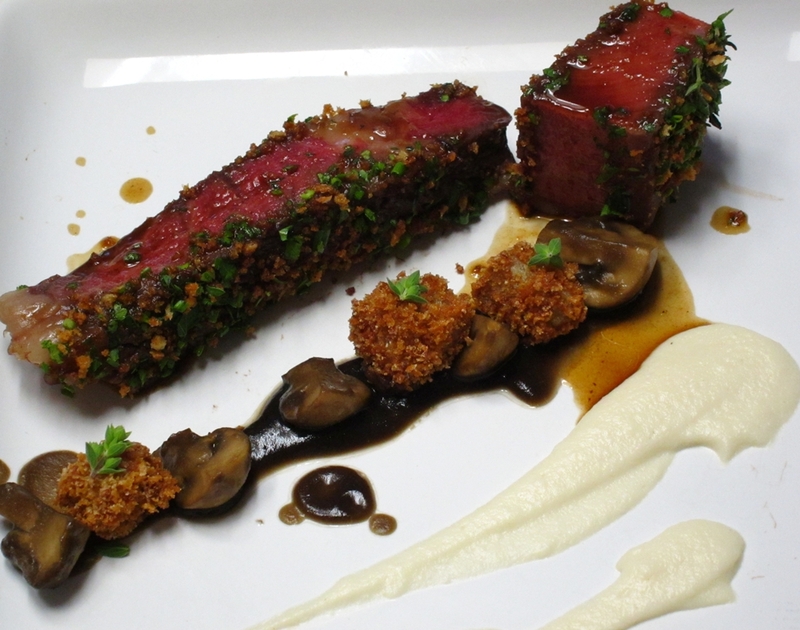 In the continuation to Blumenthal’s take on the Beef Royal dish, he prepares a steak coated with a crust made from a combination of beef crackers, panko bread crumbs, crispy short rib strands and herbs. 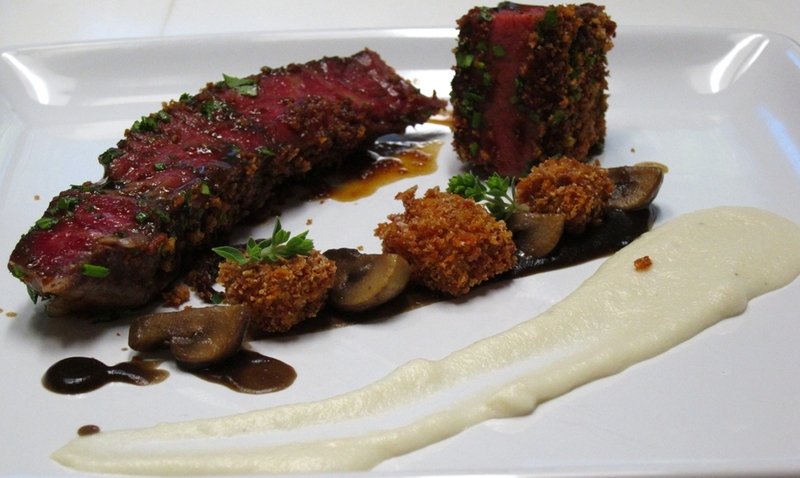 Then he serves it with a mushroom ketchup, onion sauce, reduced beef sauce, mushrooms and fried crispy bone marrow. The combination is classic and brilliantly interpreted. The most time-consuming part of this whole process is making the coating for the beef, the Chef calls it “Beef Shreds”. First, I made a beef cracker using Tapioca starch. 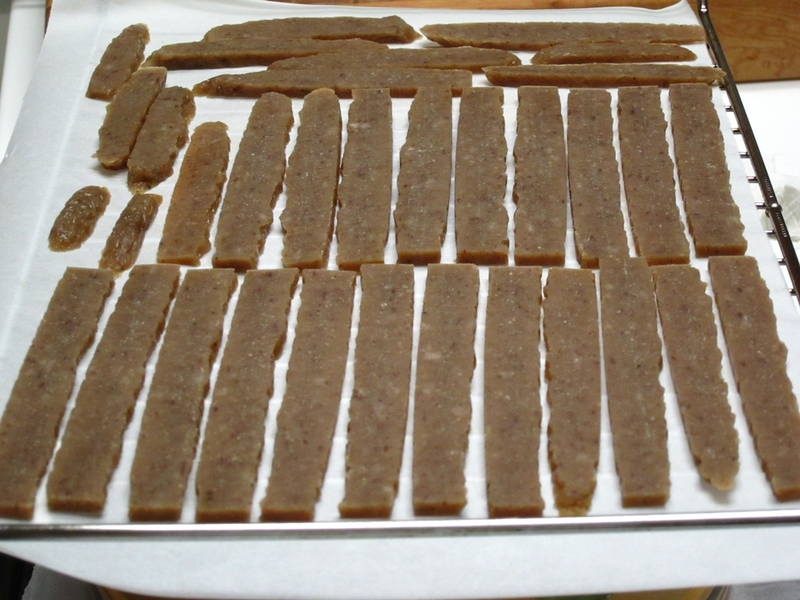 The idea for these crackers is to mix a flavorful base (in this case, ground beef, seasoning and beef sauce base from the original preparation) with Tapioca starch to make a dough. 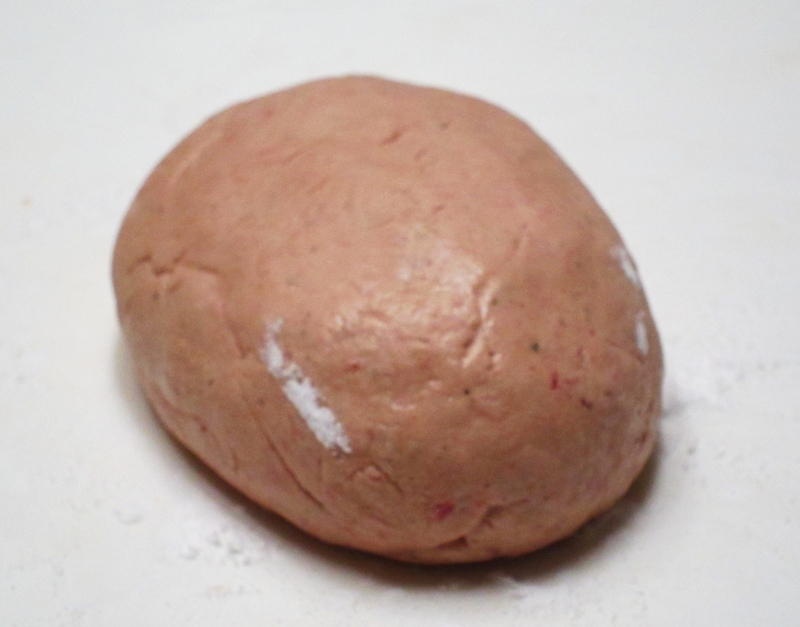 The dough is then steamed till cooked and cooled. Then it is sliced and dried for a couple of hours. The last step is to fry it. …and Fried crackers. These are crispy, spicy and tasty. I wish I saved some before pulverizing them. 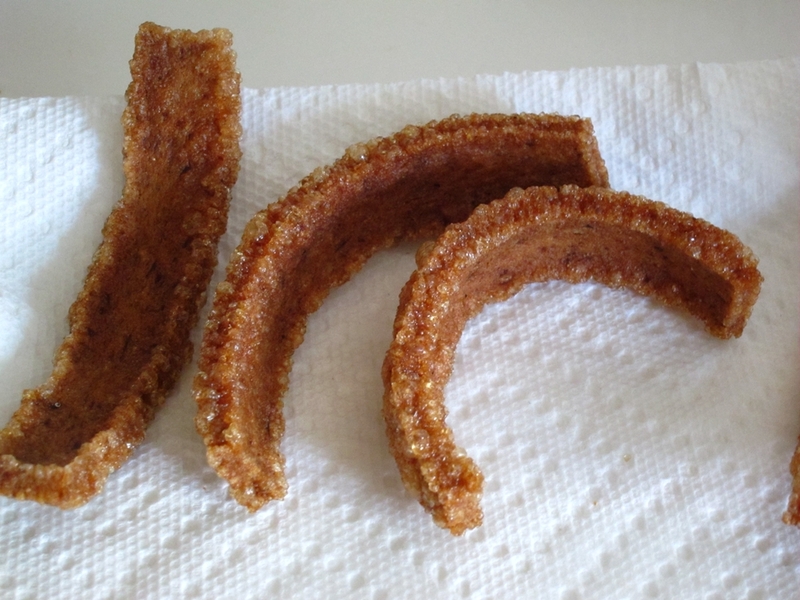 The end result is not unlike pork cracklings or chicharones. This can be done with cheese instead of beef, click here for a version from the Alinea cookbook prepared by Martin at Alineaphile. It can also be done with vegetables to get vegetable puffs or crackers, click here to see what Dave at EatFoo prepared with it. The next step in preparing the shards is to crisp up pieces from the short ribs from course #2 (I still had one in the freezer saved for this recipe) and to shred it finely. That is mixed with toasted panko bread crumbs, the beef crackers from above and finely minced herbs. For the mushroom ketchup, I used my food processor to finely mince brown mushrooms with salt. These were then allowed to drain through a cheese cloth over night. I got way more liquid than I expected. The mushrooms are squeezed to extract all the liquid and tossed away. The mushroom juice is heated briefly and set to a fluid gel with Gellan F. It is seasoned with vinegar, sugar and salt. The onion sauce is also a fluid gel made with a mixture of sautéed onions, milk, cream, thyme and then strained. The resulting sauce is set with Gellan F to get a wonderful smooth puree. This onion sauce was excellent, I ate the rest of it with a spoon after plating the dish. To prepare the marrow from the bones I first brined the bones for 24 hours then soaked them in fresh water for 30 minutes. The marrow slid right out. I cut those into small cubes, coated them with egg wash and then dredged in a mixture of untoasted panko bread crumbs and beef cracker crumbles. I held these in the fridge for a few hours until ready to fry. Right before service they were fried for a few seconds. Marrow is a lovely and luxurious product. Some love it, some hate it. I love it in small doses. It is mostly fat and is best served in small quantities. The taste is basically like beef-flavored butter. Crispy and fried, these nuggets are a tasty snack, but I had to stop after four or five. With the dish though, the fried marrow worked very well. The mushrooms were just sautéed in a little grapeseed oil and then tossed with some of the mushroom ketchup. I still have a good bit of that ketchup and I wonder how long it lasts. It’s savory and tart, sort of like a refined and subtle barbeque sauce. The star of the dish is the beef. The specific cut Blumenthal uses is the Spinalis Dorsi. That is the rib eye cap, a very tender, very well marbled piece of superb beef. 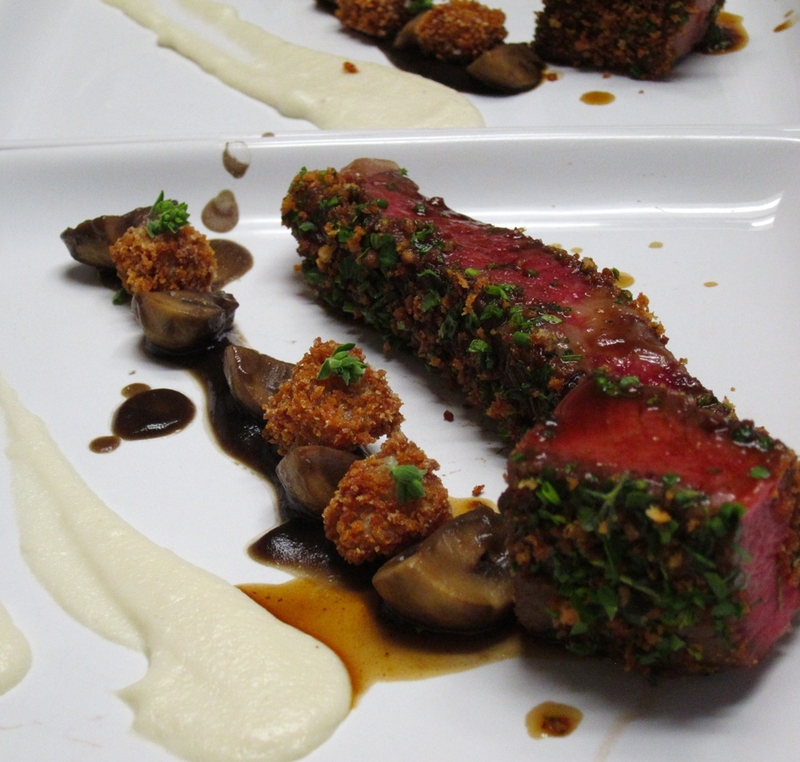 It combined the tenderness of a filet mignon with the full flavor and richness of a rib eye. To get a whole one, you will need to buy a big piece of prime rib, preferably from the center (ribs 2 to 7) and remove the cap on your own. That is damn expensive and, unless you are cooking for a crowd, a bit more than you need. What I did is remove the Spinalis Dorsi portion of the steaks I bought after cooking and trimmed them as needed. I also used a square piece of the eye of the rib to make a more substantial meal. The rest was sliced and went into tacos for the kids. I prepared the steaks by salting them well about 18 hours ahead of time and then rinsing and drying them. I cooked them en sous vide at 132 F for about 2 hours. In the book, Blumenthal does not sear the steaks after cooking, but I did, in a very hot cast iron pan for about 40 seconds per side to develop more flavor. After trimming the Spinalis and a good size cube of the beef, I coated them with reduced beef sauce base and covered the surface with the beef shreds mixture. More beef sauce was drizzled on the steaks in the plate after they were served with the onion sauce, mushroom ketchup, mushrooms and fried bone marrow. That looks really tasty! Thanks for the shout. How did you go about slicing the steamed dough? The only way that has worked well for me is with a deli slicer, but I don’t own one. To get the steamed dough thin enough I did not form into a cylinder like Blumnethal recommends. I made it into a patty and steamed it. Then sliced it by hand into 4mm or so slices. I think a bit thinner would work a bit better too. I know in Alinea that’s what they do, roll it thin, steam it, cut, dry and fry. I guess the downside to this method is that you need a lot more surface area for the steaming part. That is a very helpful video. Thanks. I really think the biggest challenge is having the frozen product at the right temperature while not watsing all of it for just a couple of scoops. My girlfriend got me Blumenthal’s book, and ever since, I’ve been eyeing this recipe. Now I HAVE to try it. Looks absolutely delicious! I would love to see your iteration of this dish. It really was one of the best if not the best steak dish I’ve ever had. Depends on the leftovers Martin 🙂 Tacos made with leftover steak? Sure. Leftover King crab legs? Not so much. 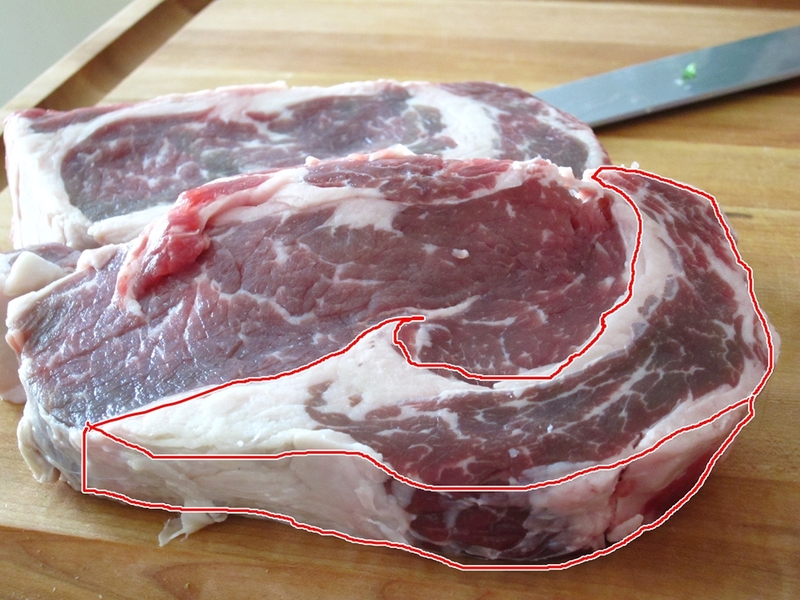 Thanks, now I know exactly what cut to ask for at the butcher and not be like: Spinalis Dorsi? Near the rib eye? No? Anyway, caught by the Fat Duck fever? Or is ‘one’ recipe enough. Hi Auldo, glad that was helpful. Funny thing is with all the work that went into course #2 and #3 of the Beef Royal, it only counts as 2/3rd of a recipe 🙂 I have not made course #1. Anyways, I definitly will be making more stuff. It’s a learning experience cooking from these books (Alinea, French Laundry, Fat Duck,…). The pork pot roast and belly you just posted on your site will definitly be on my to-do list.